Internet search inquiries into a local man with an obscure history. I give my process & results below, with my reasoning as best as I can reconstruct it. Arthur Bernard Moulton; American Caucasian male, ~92 (29 November 1921 - 20 December 2013), retired, lived in Maryland, believed to have worked for intelligence or defense agencies in unknown but possibly classified capacities during the Cold War (claims to have witnessed several atomic “shots” including at White Sands and in the south Pacific but not at Bikini Atoll). Association of Former Intelligence Officers, McLean Office Building, 6723 Whittier Ave., Suite 303A, McLean, VA 22101, Tel: 703-790-0320. Membership Directory. 1983. 103 pages. AFIO is a national organization of about 2500 members, with a smaller number active at national conventions and local chapters. It is not necessary to be a former intelligence officer to join, as long as you support the principles of the organization. Some journalists have joined just to get the membership directory, hoping to find retired officers willing to grant an occasional interview or comment on various issues. As NameBase cautions, we cannot infer much from the inclusion, but it makes a useful start because it gives us another person to look for. Googling this “Roger D. Moulton”, I find his WWII enlistment record which tells me the following useful information: Roger Moulton was born in 1921, was a white male with a highschool education, and enlisted 1943 in Bangor, Maine. Is this Arthur’s younger brother? We can find out by looking at US Census data which is released after 72 years; so luckily, the 1940 census was released in 2012. (This explains my failure to find this data ~2009.). Arthur’s 1940 Census entry tells us that in 1940 he was aged 19 (b. 1921, New Hampshire); he had a widowed mother Ida D (b. 1884, Michigan), a brother Roger D (b. 1922, Maine), & a sister Jean R (b. 1927, Minnesota). (Family legend confirms that Arthur’s mother was indeed widowed; supposedly, his father was working with some other men on some sort of electrified wire and they all were electrocuted while Arthur watched as a young boy.) We get more detailed information by reading the scanned census form: Ida, Arthur, & Roger are listed as having graduated highschool but Jean had completed only her first year of highschool. The 3 siblings had attended school at some time ‘since March 1940’. No one in the family, including the “lodger” Richard Brant, was employed at the time (except for Ida doing housework). Issues here include: why does the census birth-year 1922 for Roger differ from the enlistment record 1921? He was 22 when he enlisted (1943 - 1921 = 22) so there was no need to lie. How did Arthur’s father die? Was one lodger really enough to pay their bills? What did Arthur and Roger do in between 1940 and 1943, given that they had apparently graduated highschool but were not in the military (the US officially entered WWII on 11 December 1941) and Roger’s “Civilian Occupation” is “Undefined Code” in the enlistment paper? This invention is in ring circuits and specifically is ring circuit utilizing gas filled tubes only. One object of the invention is to provide a ring one gas filled tube for each stage. Another object of the invention is to provide a of the nature mentioned requiring no source such as is usually required. Other objects will be apparent from a reading of specification and claims. The drawing is a schematic diagram of a ring to my invention. This invention relates to electrical measuring apparatus, and, more particularly, to apparatus for measuring a difference in frequency between two alternating voltages. Abstract: Simulation of submarine propeller cavitation as it varies with speed and depth of submergence is effected by feeding a frequency proportional to blade rate to a counter which is periodically read out and reset at a rate proportional with the square root of pressure. The read out is used to control noise attenuator means including a one of N decoder and N attenuators scaled to produce relative noise according to a curve characteristic of the submarine to be simulated. The noise output is modulated in pulse width and repetition rate by a function generator controlled by the counter read-out. I am unable to find anything about that application. It may be classified but the Navy, as of 2012, holds only 29 secret patents (out of a total of 5321 such patents, out of >6 million patents ever issued), so it’s possible that the patent application was simply rejected or abandoned. Patent #2 is interesting for being assigned to General Dynamics Corporation, what is now one of the largest defense conglomerates in the world. But in 1956 it was much smaller, had recently bought the airplane manufacturer Canadair and had only adopted that name in 1952, then purchasing Convair in 1953; they began building all sorts of military airplanes, the Atlas ICBM, and civilian airliners. The original Convair plant was located in San Diego, where Arthur is listed as filing the patent from in 1954. In that year, Convair was either manufacturing or developing the Convair B-36, Convair F-102 Delta Dagger, Convair B-58 Hustler, and the SM-65 Atlas (substantially modified partway through the design process due to successful H-bomb tests). The patent seems like it could’ve been useful for any of these. The names are listed in an unknown context (the book is still in copyright); while he was single in the 1940 census, in 1946, Arthur would have been ~25 and so could be married, and he is not due in California for another 8 years. This is may be another red herring: the Maine Marriage History archive turns up 3 marriages for a “MOULTON ARTHUR B” in 1903 and 1933, which cannot be this Arthur (who was not even alive in 1903) but the women involved are well within living distance of 1946. This article is a reprint from the May 31, 1963 issue of electronics. Selecting component values for generating a critically damped transient in a simple RLC circuit is a cut-and-try under conditions frequently not in practice. Component selection is made easier by the normalized graphs given in this article. One copy per person only, if more are required regular reprint costs apply. Arthur would be ~42. A family story reports him working at the Lawrence Livermore National Laboratory, as might be expected given his previous career and the location, but a search of the LLNL site failed to turn up anything. Archives of the defunct magazine are not available online, but a request was successful in producing a scanned copy; unfortunately, it includes no useful details beyond what the snippet provided. Laurel, Maryland, incidentally, is located near the NSA’s headquarters. Arthur would be ~52. There turns out to be a possible explanation for this: in the ’70s, Arthur’s brother Roger was working for the NSA as a contractor on an unusual pair of computers (see later section), and so it would make sense for him to be living near the headquarters such/ as the town Laurel, and if Roger is there, then there are many reasons Arthur might be: renting a room from Roger, wishing to be near Roger, drawing on connections for work, etc. Main Masque 2,3; Scabbard and Blade 3; M.O.C. 2; A.I.E.E. 3; Radio Club 3; Vice President, I.S.O. 3; Men’s Student Senate 3; Dean’s List 1b, 2a, 2b. This unexpected re-appearance of his brother Roger prompted me to search for Roger some more, and I hit pay dirt. It turns out that the people who worked on two early NSA supercomputers, the IBM 7030 Stretch and the Harvest, have held reunions. In the collated org chart and the apparently-current contact information, we find the entry “Roger D. Moulton org nsa harvest silo memory contract”. Unfortunately, further details seem hard to find. Aside from a mention on a York High School reunion page, the hits for Roger D. Moulton are contaminated by some chemist’s papers/citations/patents. I have to admit defeat at this point - I’ve checked all the databases I can easily think of, so for followup, I created a Google Alert in case additional materials surface on the public web ("Arthur Bernard Moulton" OR "Arthur B Moulton" OR "Arthur B. Moulton" OR "Roger D. Moulton" OR "Roger D Moulton"). We’ll see. But by 28 December 2013, nothing useful had appeared. 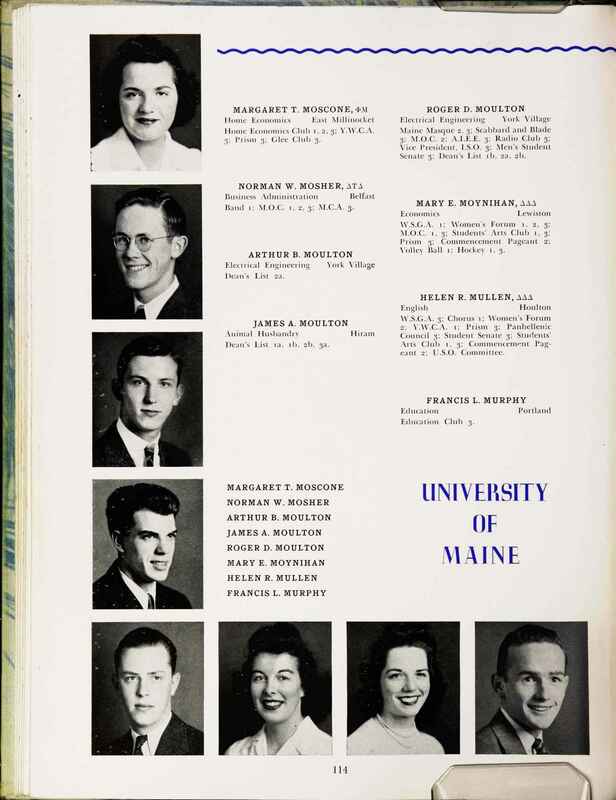 Arthur attended McIntosh Business School in Dover, NH and graduated from the University of Maine in 1942, with a B.A. in Electrical Engineering and was also a member of the American Institute of Electrical Engineering. Arthur joined the Navy and served in World War II as a Radar Engineer. After time in the service, Arthur went to work for Singer Corporation. He purchased his “little cottage” in Scotland, MD in the 1960’s where he enjoyed his retirement until his passing. He enjoyed photography, chatting on his ham radio, traveling, spending time on Point Lookout State Park, the Chesapeake Bay as well as spending time with friends and family. Overall, consistent with my findings but I missed the Singer Corporation part, and the ostensible retirement, although the hits suggest he kept working part-time or on a freelance basis and may not have lived in Scotland full-time starting in the 1960s, even if he bought the cottage there then.